Home MTAANI NEWS Thika MP pays fare for upcountry voters, spends entire day mobilising voters to polling stations. Thika MP pays fare for upcountry voters, spends entire day mobilising voters to polling stations. Eng. Patrick Wainaina at Thika main bus station seen here wooing people to go out and vote. He said that he was targeting a 95% voter turnout in his constituency. Thika MP Eng. Patrick Wainaina Wa Jungle spent the entire Thursday afternoon wooing voters to go and vote in a bid to realise a 90% voter turnout in the constituency. Wainaina crisscrossed the constituency, racing to sway undecided voters and to mobilise Jubilee supporters to vote before the close of the polling stations. 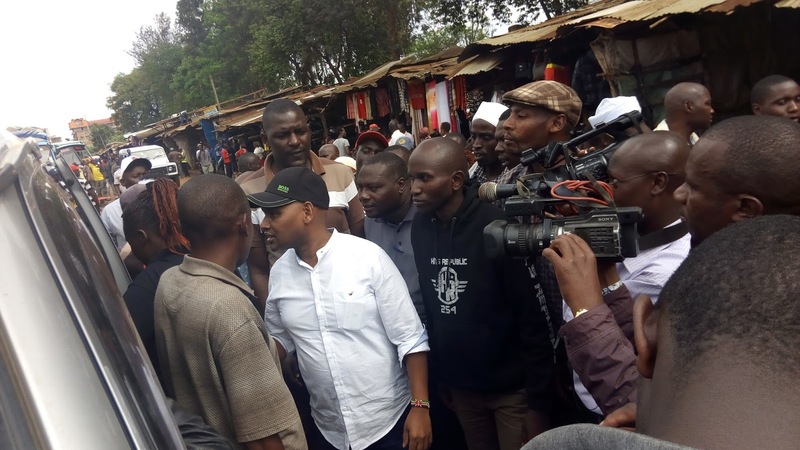 With a few hours left before the closure of the polling station, the legislator visited the populous Thika main bus station, the CBD and at the Whiteline stage, pleading with all the potential voters to exercise their constitutional right to choose their destiny. 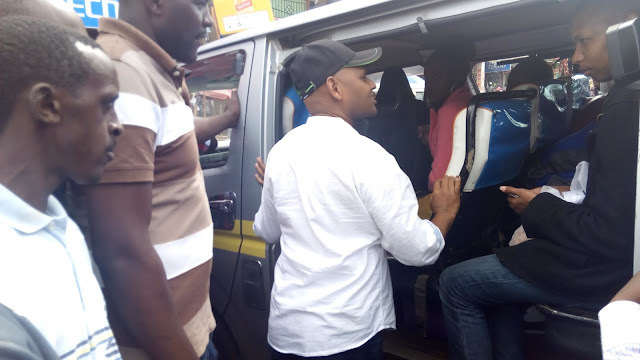 At one instance, the MP caused some drama when he reprimanded some matatu crew who had taken advantage of the boom in passengers to hike fares, forcing them to refund the extra amount overcharged. He also paid fares for anyone who was found going upcountry to vote. “Overcharging these people is very wrong and unpatriotic. They are sacrificing their time and money to go and exercise their democratic right to choose their destiny then some selfish matatu crew being driven by greed is trying to extort from them. Very shameful,” said Wainaina. He admitted that Kenyans were already tired of the continuous politicking at the expense of development thus the need to settle this matter once and for all. He lamented that the long electioneering period had affected his programme for the constituency which he said was three months behind schedule. “It is now a year since we started these campaigns, totally interfering with the citizen’s day to day activities. The people are now exhausted and really want an end to this,” he said. 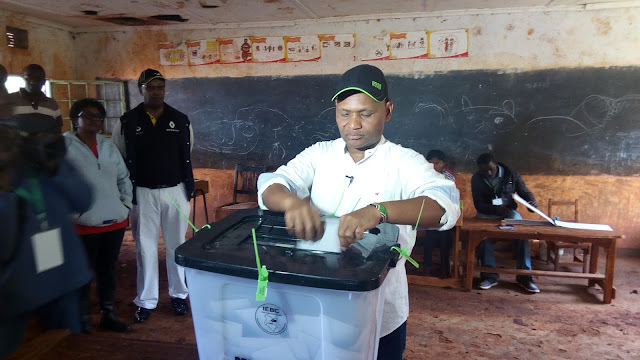 Earlier Wainaina cast his vote at Heshima Primary School polling Center where he attributed the slow pace in the morning hours to the morning rains. However he said that he was happy that things were brightening up as the day progressed. Throughout the day, his campaign team went round, both within and without the constituency, providing transport to all those who had challenges in accessing the polling stations they were registered. Using a call centre to coordinate these activities, the MP was able to receive all general concerns of his constituents real-time and send the appropriate remedy promptly. “We have established a call centre where all challenges faced while voting are channeled through for action. In case one is stuck, they can just call our elections hotline via 0720888453 for immediate action,” explained the MP. Wainaina clarified that they had three modes of transport namely, bodabodas, small vans and buses to cater for all the transport needs of the voters depending on their individual or collective needs. By one o’clock, the voter turnout was about 60% in majority of the polling stations, a situation that the MP attributed to the morning drizzles that had dampened the day. However, Wainaina was happy that the situation was gradually improving as the day progressed with many people seen lining up to votes.